The best products at the best price. The Heavy Duty 23 Stitch sewing machine is an extra-high speed sewing machine that runs on a powerful commercial grade motor. Unlike most sewing machines, this machine can sew through just about anything! The machine features 23 built in stitch patterns, an automatic needle threader, drop feed for free motion sewing, and has the ability to sew 1,1000 stitches per minute. Extra items in picture not included Fully automatic one step buttonhole Drop feed for free motion sewing adds a new dimension of ease to such serious sewing Accessory storage and adjustable presser for foot pressure included Quilting/stitch guide, spool caps, screwdriver, lint brush/seam puller, bobbins and needles also included Assembly level/degree of difficulty: No Assembly Required. 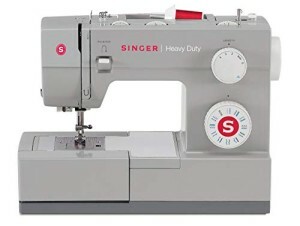 SINGER HEAVY DUTY SEWING MACHINE: The 23 built-in stitches including basic, stretch, decorative, and buttonhole stitches allow you to sew a variety of projects, such as fashions, home décor, quilts, crafts, and more! AUTOMATIC NEEDLE THREADER SEWING MACHINE: After following the threading path printed right on the machine, this built-in feature helps you to effortlessly thread the eye of the needle without eye strain or frustration. HIGH-SPEED SEWING MACHINE:The Singer 4423 Sewing Machine has a maximum sewing speed of 1, 100 stitches-per-minute, so projects can be sewn quickly. The 60% Stronger Motor provides greater piercing power for thick seams. HEAVY DUTY METAL FRAME: Adds stability and provides long lasting stability.